FriendFeed, October 2007 - April 2015 R.I.P. Various types of biometrics - face, finger, iris, vein, voice, etc. - are used in a variety of vertical markets, including elections. While the use of biometrics in elections is controversial in my country, it's a little less controversial in other countries. There is a spirited debate about the use of thumbprints to identify legitimate voters in Nigeria. Some argue that this can reduce fraud, while others argue that the technology doesn't work, and may disenfranchise qualified voters who are falsely rejected. But it turns out that some problems are very easy to solve. One of the tools used in Nigeria's voting process is a card reader that needs to read a special card that stores the features of the voter's thumbprint. Premium Times reports that at one polling place, the card readers just wouldn't work. A citizen observer approached a woman who worked for the election authority. (She) inspected the reader only to find the protective film on the lens of the reader had not been removed. That's right. When the readers were shipped to Nigeria, they had the type of protective material that all electronics have when they're shipped. And in this case, someone apparently failed to remove the protective film that protected the card reader. Yup, there was an argument between the observer, who was trying to tell the election worker to remove the film, and the election official, who initially refused to do so. She eventually relented...and the card readers worked much, much better. In defense of the election officials, this is the first time that they had worked with such a device, so they wouldn't have necessarily known that the protective film was only a temporary measure. If only all problems were that easy to solve. P.S. For those who like to follow the links, here's another one. Speaking of oatmeal, have you heard of the new Cereality restaurant concept? It’s premiered in Philadelphia, and could be in Los Angeles within a year. Cereality - a restaurant that sells cereal morning, noon, and evening - was supposedly going to be the next big thing. However, I guess I lost my initial enthusiasm for the idea, since I never wrote about Cereality in any of my own blogs. And I walked right on without even looking at the place. I just wasn't in the mood for dinner at 6 pm local time. And if you're going to look for Cereality, there aren't many places to look. I guess Philadelphia didn't care for it. Did I forget to mention that I changed jobs last month? An example of this occurred in a hotel room in Costa Mesa, California on Thursday, October 22, 2009. You weren't there, but I brought you there via the miracle of blogging. And now our user conference has had its final sessions and its closing banquet. So, for all intents and purposes, my last duties as a product manager ended at 10:00 pm on Thursday, October 22, and I'm embarking on proposals duties. To save you the effort of reading through the entire post, I'll just say that I found out late in the summer of 2009 that I'd be transitioning to Proposals, but I had several product management duties that I had to fulfill before I could transfer to Proposals full-time. If you happened to see my recent update to my LinkedIn profile, you now know that I just revealed (several weeks after the fact) another job transition. If I were to go to the trouble of identifying a time when this transition was complete, it took place at 3:00 pm on Wednesday, February 4. Rather than sitting in a hotel room at the conclusion of a sumptuous banquet, I was sitting in an office cubicle at the completion (or, more technically, the transfer) of my final proposal. I will not go into the details of the length of this transition, other than to say that it was shorter than my 2009 transition. Neither will I reveal the reason why I did not announce this transition until over a month later; suffice it to say that there was a good reason for this. And I will not reveal the internal corporate moves that resulted in this transition, other than to say that my job transition was one of several that occurred. I will, however, note how I ended up in a position to be transitioned - because, unlike 2009, I had some role in shaping what happened to me. When I rejoined Proposals in 2009, one of my first moves was to reactivate my lapsed membership in the Association of Proposal Management Professionals (APMP). I have derived a number of benefits from my APMP membership, some of which I've discussed in this blog. (Here are all blog posts that include the #apmp hashtag.) But in my case, one of the key benefits that I derived was the knowledge that much of the work for a proposal occurs long before the proposal is written. Specifically, a proposal is (often enough) a response to a document called a Request for Proposal (RFP). 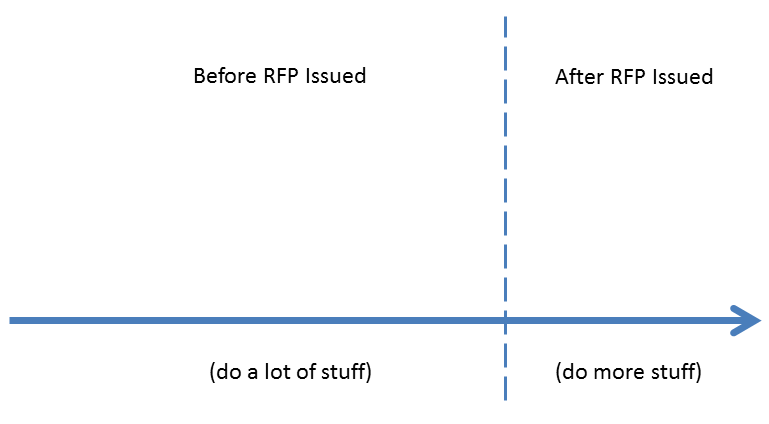 While there are proposal writers and others who become engaged after the RFP is released, much of the work to respond to a proposal comes long before an RFP is ever issued. Companies try to influence the scope or content of the RFP. Even before this, they work to ensure that they have product offerings that can satisfy the needs of any potential RFP. 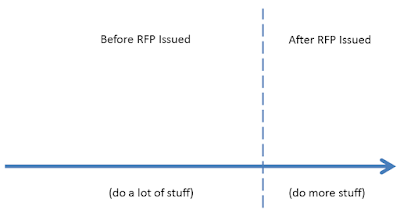 With all of this work, key proposal practitioners who illustrate the proposal development process place the majority of the work on the left side of the graph, before the RFP is issued. Now I would show one of the graphs that key proposal practitioners use, but they're all copyrighted. Therefore, I am going to display my own copyright-free version of the presales/proposal development process; I hope that this version doesn't violate any copyrights. If you want to see an example of a REAL presales/proposal development process, go here. After a few years of exposure to these kinds of things, this got me thinking - do I want to work on the right of the graph, or do I want to move over to the left side? APMP®, the global association of record for bid, capture and business development professionals announced the formation of its new Center for Business Development Excellence (CBDE), a community for senior-level BD professionals throughout the world, at last week’s Bid & Proposal Con 2013 in Atlanta, GA.
Perhaps some day the APMP will change its name to something that reflects its expanded mission. And now that I've talked about this, I can also talk about something that I mentioned in a recent blog post. I've mentioned [Colleen] Jolly in this blog several times (twice in 2014 alone, in September and November). Jolly's company, the 24 Hour Company, has done business with my own, and Jolly has also been personally inspirational (I'll talk more about that at a later time). This "personal inspiration" occurred at last year's APMP Bid & Proposal Con in Chicago. My general rule at such conferences is to ensure that my primary purpose at the conference is to the company that sent me (MorphoTrak, Motorola, whoever). However, as long as that primary purpose is achieved, I'll certainly look for things that benefit me personally. Bid & Proposal Con had several morning keynotes, and Jolly delivered one of them. She spoke about work and passion, including the times when one is working without passion. For example, Jolly started college as a computer science major because she felt it was what she was supposed to do, but she found that she had no passion for computer science and eventually changed her major. This is something that is...well, I guess you can say that it's strategic. Sometimes it's expressed as the standard job interview question "Where would you like to be in five years?" Of course, the implications of a "personal story" go well beyond career. I will not go into the specifics, but about three months after that keynote, I took the opportunity to start rewriting my story. And nine months after that keynote, I started writing a new chapter...which, in a couple of months, will include time in a hotel room in Costa Mesa, California. P.S. I never got around to the flying pigs story. I still owe that to you. I wasn't around back then, but Macy's obviously got a lot of free publicity from that plot twist. However, that was just a movie. Reality is slightly different. But in a new lawsuit brought by the company that echoes a suit from 2011 that was slated to come to trial soon, Macy’s says the California company behind the resurrection of Hydrox and Astro Pops is infringing on trademarks it held for many of those recognizable brand names. Strategic Marks has countersued, claiming that Macy’s had abandoned the trademarks, and citing the Lanham Act again. Under that act, a mark is considered abandoned if it isn’t used in the three years. In fact, claims Strategic Marks, Macy’s is the one doing the infringing on the marks it obtained, by selling vintage brand T-shirts and tote bags on www.macys.com. Not that I'm about to open The Broadway, or any other Macy's (actually Federated) acquired brand. But I guess I could try. Hot on the heels of Costco's announcement that it would cease its designation of American Express as Costco's exclusive credit card provider and partner with Citi/Visa instead, there's news that the exclusive deal between Green Dot and Walmart may be unraveling. At the end of its current contract with Green Dot, Walmart is expected to either not renew or vastly restructure the arrangement to cut Green Dot’s commission rate. Either outcome, Seeking Alpha reported, is likely to be quite damaging to Green Dot, which in 2013 relied on Walmart for 64 percent of its total operating revenues and more than of 82 precent of its total units sold. PYMNTS.COM speculates that Green Dot may continue the deal at a reduced commission, or perhaps some other company may step in as an exclusive or non-exclusive credit card provider. American Express was mentioned. Even if a competing company can't get an exclusive deal, Green Dot would lose some portion of its revenue. There are some differences between the Costco and Walmart cases. The Green Dot card is a prepaid card, most beneficial to people who do not have bank accounts (Walmart is actively courting this market). Walmart, however, accepts all sorts of other cards - it's just convenient to buy your prepaid card from Walmart. Costco, on the other hand, accepts only one credit card - the American Express card - although you can use any debit card in Costco. Despite the differences, there is one similarity. In both of these cases, the retailer (Costco, Walmart) is calling the shots, even when dealing with a large company like American Express or Citi. Eric Dahl, B.B. King, Toyota...and Camry Effect II: Stolen Guitar! You know that heartwarming commercial? According to a lawsuit, it's based on a copyrighted book. The heartwarming commercial in question is this one, in which a young woman finds a guitar, gets in her Toyota Camry, and returns the guitar to its rightful owner - B.B. King. Eric Dahl didn't find the commercial to be particularly heartwarming. In an extremely bizarre coincidence, Dahl himself (who, for the record, is not a young woman) happened to find a guitar, which he returned to its rightful owner - B.B. King. Dahl recorded the story in the book B.B. King's Lucille and the Loves Before Her, well before Toyota Motor Sales USA, advertising firm Saatchi & Saatchi North America, and ad producer Smuggler created the commercial above. As I noted in October, Dahl took Toyota, Saatchi & Saatchi, and Smuggler to court. Courthouse News Service was the source for my October post, and it has published an update. Fatal to his claim, Mr. Dahl conflates the concept of the expression of the story (protectable) with the basic idea of the story (not protectable). The concept of a musician who loses a musical instrument which is later found and returned is not unique to plaintiff nor can he claim copyright protection over all such stories. Nor does the fact that the musician in both stories is Mr. King change that result; as a matter of law, plaintiff must point to the expression of his own story in the ad, not some common facts, to make out a claim. "Defendants misapply this rule of law to plaintiff's complaint. Although general themes and ideas are not copyrightable, parallels to more specific elements of a particular expression are protected," he wrote. He found that Dahl "adequately alleges similarities between the plot, characters and sequence of events, among other factors, of the two works." This does NOT mean that Dahl won; it merely means that the case can proceed. Dahl may win at trial, Toyota may win at trial, or perhaps the parties will settle. This is yet more bad news for Toyota Camry marketing efforts. Remember the 2012 Super Bowl brouhaha, when any mention of the game on Twitter would result in a response tweet regarding "the Camry Effect"? This turned out to be another promotion involving several parties: Toyota, Saatchi & Saatchi, American Pop, and other companies. In both the 2012 case and this case, Toyota itself may not have been directly responsible for the bad thing (tweet-spamming, adapting Dahl's book), but in both cases Toyota stood up front and center rather than pointing fingers at Saatchi & Saatchi or some other partner. But we don't know what's going on behind closed doors. I have always maintained that your view of the online world is greatly governed by your lircles (lists, circles, whatever your service calls them). While 7 billion people of the world were spending Monday paying attention to a computer watch, or simply trying to survive, a significant portion of people in my lircles were talking about FriendFeed's final month. I've already written about it. Twice. Others have weighed in, such as Louis Gray. One thing old FriendFeed users have in common - we DON'T. SHUT. UP. I could theoretically write a history of FriendFeed myself, but there are other people who are much better equipped to do that. But I got to wondering - when did I first hear about FriendFeed? I had to go back - way back - to find out the answer. Cue up a post that I wrote on Sunday, October 28, 2007. Back then, my online presence was under a pseudonym (Ontario Emperor). And under that name, I wrote a post called "Experimenting with FriendFeed." Little did Winer realize at the time that many people would (unfortunately) conclude that RSS itself was useless. But back to me. These mentions from Winer piqued my curiosity, so I created a FriendFeed page under my Ontario Emperor pseudonym. My Empoprises FriendFeed page would come later. I'm not going to bother to link to either of them, since if you're reading this post a couple of months from now, those two pages (probably) will not exist. So what was the first thing that attracted me to FriendFeed? Its initial killer feature, aggregation. I've linked Friendfeed to a few of my services, including a last.fm page that I rarely touch. Well, I touch that last.fm page much more now. Sort of; I actually touch Spotify, which scrobbles to last.fm. But I digress. This whole idea of aggregating services seemed fascinating from a theoretical standpoint, but I didn't know whether it was anything more than that. Not sure if it will prove useful in the long run, but we'll see. What I didn't know at the time was that there were people like Mark Krynsky - whom I would meet at a FriendFeed meetup later - who were actively looking at something called "lifestreaming," anticipating the moment that every aspect of our lives would be recorded online. And FriendFeed was, in some respects, the beginning of that. Although I didn't realize it, since my final comment on that first post compared FriendFeed to...MyBlogLog. I've already observed that the list of services supported by Friendfeed is shorter than the list of services supported by MyBlogLog (my page for the latter service is here). However, MyBlogLog only provides links to the individual services; Friendfeed aggregates their content. While myself and certain of my noisy friends will rave about the FriendFeed community - witness my semi-random mention of "19,000 likes" and "10,000 comments," something that will cause a few to shed a tear - the real power of FriendFeed was that it caused some very influential people to spend some time lifestreaming, paving the way for many of our interactions today. Think about it. What if you never paid attention to sharing where you've been, how many steps you've taken, or how many books you've read? I'm not saying that FriendFeed directly resulted in Foursquare, Runkeeper, Goodreads, and the like, but it certainly opened the eyes of many people to lifestreaming possibilities. But I'm going to give the aforementioned Mark Krynsky the last word - something that I've taken from a blog post that he wrote a few months after chowing down at Five Guys with me - and a couple of days after Facebook acquired FriendFeed. FriendFeed chose to pave a new path beyond solely being a Lifestreaming service. They quickly became a differentiating service when they decided to go down the SocialStream path and focus on creating conversations around the items that made up people’s Lifestreams. They did this by launching two features that would become their defining ones to achieve this. First they created a very quick and simple way to allow people to create comments on items. Then they changed the logic of just displaying a reverse chronological stream of items by introducing the “like” feature. As users of the service would click on the like button (or comment on them), that item would re-appear withing peoples streams. These two features (which were both subsequently copied and implemented by Facebook) are what propelled them to become a very powerful conversational platform that I feel has to this day not been matched in another service. So even if you aren't the Foursquare or Runkeeper type, consider that a billion-plus Facebook users are liking and commenting on things - a feature that Facebook borrowed from FriendFeed even before the acquisition, and a feature that is all over the place today. And it all started on FriendFeed, including the guy who amassed 19,000 likes and 10,000 comments. Damn him. In addition to some of the changes that I mentioned in my last post - there's no Google Reader output to aggregate any more - Kurt Wagner has pointed out two other things that have changed over the years. First, Wagner noted that Facebook's acquisition of FriendFeed - "considered a big deal at the time" - was a $50 million acquisition. Compare that to the $19 billion acquisition of WhatsApp last year. Another difference? At the time of the acquisition, Facebook had 250 million users. It's grown a bit since. Fittingly enough, I learned about this on Facebook. I can't remember when I last logged into FriendFeed. Not only does the service have a character limitation, but apparently there's no easy way to export data from the service - something that, say, Google has allowed for years. Of course, these limitations are not surprising, nor is the announced closure of FriendFeed. After all, save for one feature revision that I know of, no new development has taken place at FriendFeed since Facebook acquired FriendFeed and its people in August 2009. In a way, FriendFeed is kind of like a time machine. Look at the services that you can incorporate into your FriendFeed - Google Reader, anyone? - and the services that aren't even listed. I'm sure that a Louis Gray or a Josh Haley or a Johnny Worthington or a Mark Wilson will wax prosetic on the significance of FriendFeed, but it's fair to say that FriendFeed profoundly influenced how we share and interact with each other today. Let the tributes pour in. Heck, even MG Siegler might have something nice to say. You may recall one of my posts from last Friday, which noted that different countries and cultures have different standards for what is considered objectionable content. This causes problems for multinational corporations that have to somehow comply with all of the local standards at once. In other words, if you're in Saudi Arabia, you can't insult the President of the United States. Which is odd, because here in the United States, it's almost a civic duty to insult the President of the United States. The current President doesn't love his country. His predecessor is a literal idiot. His predecessor's predecessor is a deviant sexual predator. And all of them are enslaved to the Illuminati. But the Saudi example pales in comparison to another recent example of a conflict between local standards and the standards of a multinational corporation. Before I discuss this recent example, let's take a look at Twitter's Twitter Rules. Specifically, let's look at two of them. You can see the potential conflict right there. Twitter establishes a whole bunch of rules, but then says that users "agree to comply with all local laws." What if the local laws conflicted with the Twitter Rules? Specifically, what if Twitter's prohibition of violence and threats violated a local law? Supporters of the ISIS terror group tweeted thousands of messages on Friday bearing the hashtag #AmessagefromISIStoUS featuring gruesome photos and threats to U.S. soldiers and citizens after American airstrikes took out terrorist targets in Iraq for the first time. Some tweeted photos depict dead U.S. Army soldiers, U.S. marines hung from bridges in Fallujah, decapitated men, human heads on spikes, and the twin towers in flames on September 11, 2001. Obviously these messages and many others like them violate the "Twitter Rules," so Twitter has been shutting down these accounts. You can guess what happened next. Yup, now ISIS is threatening violence against Jack Dorsey. Isis supporters have threatened Twitter employees, including co-founder Jack Dorsey specifically, with death over the social network’s practice of blocking accounts associated with the group. I'm sure that the whole episode has gotten some people in ISIS talking. These aren't dummies; many of them are well educated. And it probably drives them crazy that they have to use their hands to type tweets that are hosted and managed by a Crusader atheist social media service like Twitter. Of course, if ISIS creates its own social media outlet, it will need to create its own terms of service. Somehow I suspect that they would be very different from Twitter's "rules." While the ISIS TOS would presumably be written in Arabic, I have taken the liberty of creating an English language version of what some of those rules would look like. Private information: If a person has insulted the Caliphate, you must publish and post the person's private and confidential information, such as credit card numbers, street address or Social Security/National Identity numbers, even if you do not have the person's express authorization and permission. Violence and Threats: You are required to publish and post direct, specific threats of violence against those who insult the Caliphate. Of course, we know what would happen. The Great Firewall of China, which prevents objectionable words like "democracy" from entering China, would be replicated in every other country, ensuring that no one could see ISIS-authored content. I tend to prefer to do things asynchronously, except when I don't. While there are things that require synchronous activity - kissing, for example, is not fun if the two people aren't kissing each other at the same time - there are things that can be handled either by synchronous or asynchronous means. I recently had to visit the AutoZone website - my tail light needed replacement, and I wanted to find an AutoZone near my work. As I entered the website, I was asked if I wanted to take one of those surveys about my experience. I was in a survey answering mood, so I gave my assent. After leaving autozone.com, I completed the survey, and then was asked if I would be willing to be contacted about my responses. I decided that I would be willing to be contacted - on my terms. I gave AutoZone an email address that it probably already had (I'm a member of their club), but I left the phone number blank. While I'm willing to take calls at work or at home about a variety of subjects, I don't really want my life interrupted with a phone call about a retail website. However, it turns out that AutoZone didn't like my response. Yes, the phone number is a REQUIRED field. In other words, if you want to do AutoZone a favor and provide additional feedback about its website, you MUST give them a phone number. However, I do have a good thing to say about AutoZone. When I bought my tail light later that day at the AutoZone in east Fullerton, I also bought one of those 12-in-1 tools. (I don't carry a toolbox in my car, and I needed a tool to change the tail light.) Because it is a 12-in-1 tool, it provides me with features above and beyond what I requested. For example, now I can clean fish! As I have mentioned before, I work for MorphoTrak. While there is a rather involved hierarchy of parent and child corporations, when you trace to the top, MorphoTrak is part of a worldwide conglomerate called Safran. I recently needed to find the address for Safran USA's DC area office, so I went to a trusty search engine (in this case, Bing) and entered some search terms. But what happens when you type a word correctly, but the web page thinks that you misspelled it? My employer "Safran" has a distinct name, but there are often cases in which Bing or Google or whoever is convinced that I obviously meant to type "saffron" instead. This is what happened when I conducted my search. Rather than providing me with the address of Safran USA's office in the Washington DC area, here was the first result in the search listings. Now my employer Safran IS a worldwide conglomerate that is involved in a number of businesses, but belly dance is not one of them. However, this search engine mistake led me to a valuable business lesson - one in which Colleen Jolly is involved. I've mentioned Jolly in this blog several times (twice in 2014 alone, in September and November). Jolly's company, the 24 Hour Company, has done business with my own, and Jolly has also been personally inspirational (I'll talk more about that at a later time). But she, like anyone else, also needs to be inspired, as she detailed - not in her own blog (although she's probably discussed it here), but in Todd Nielsen's International Leadership Blogathon. She started with a story. I am a leader in my primary business, and serve as a leader for multiple non-profit organizations. Losing my “mojo” was not just bad for business—it was making me physically ill and emotionally depressed. A leader needs to always know where they are going, or at least be happy and positive trudging through the difficult jungles of economic uncertainty. I was neither happy nor positive and it was starting to show, affecting the morale of my team and our ability to provide true value to our customers. I had to do something to dramatically change my outlook. So what did Jolly choose to do? Pole dancing! For Jolly's explanation of how pole dancing benefited her personally, read the post. But how did her business and nonprofit activities benefit? [M]y outlook has [gotten much rosier] and my passion for providing excellent service wearing all my many professional “hats” has improved dramatically. I’m bothered less by the little things that used to easily derail my optimism and I’m not afraid of what others think about how I live my life and run my businesses. If I could swing my entire body upside down, I could do anything! So there's possible benefits in removing yourself from your comfort zone, facing a brand new challenge, and then extrapolating that experience to your day-to-day affairs. But I don't think I'll be flying to Arlington, Virginia for belly dance classes just yet.